Syracuse Clerk-Treasurer Paula Kehr-Wicker, left, gives the oath of office to Syracuse Police Officer Cody Leer. Leer has worked for the department as a reserve officer and has been hired full-time. Looking on is Town Manager Henry DeJulia. 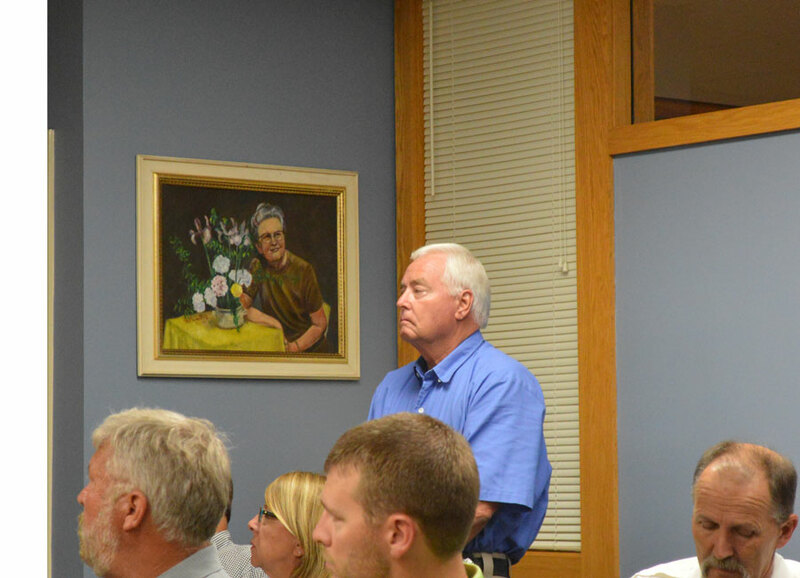 SYRACUSE — Ken Troutman and Cody Leer were introduced to the Syracuse Town Council at the start of its regular monthly meeting Tuesday night, Sept. 18. Troutman is the new ordinance enforcement officer. He has 30 years experience in construction and has done several mission trips involving building projects in the past. Ken Troutman stands as he is introduced to the Syracuse Town Council. He will be the new ordinance enforcement officer working part time with the Syracuse Police Department. 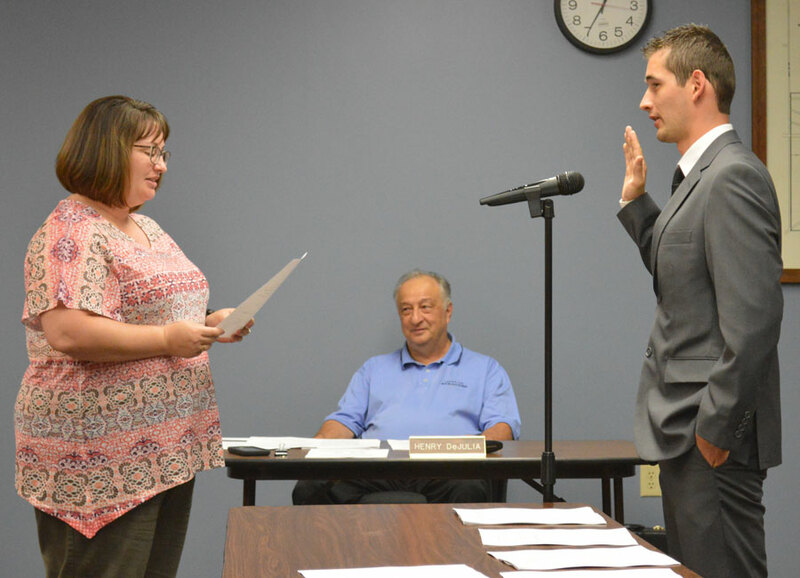 Leer was sworn in as a new full-time Syracuse police officer. He had worked as a reserve officer prior to being promoted. The council held a public hearing regarding a tax abatement for Driven Innovations. There were no remonstrators. Resident Sharon Fowler asked what Driven Innovations does, Council President Bill Musser stated the company makes products related to the RV industry. The council passed a confirmatory resolution for tax abatement for TC Commercial Properties/Driven Innovations. An ordinance appropriating $255,438.32 from local road and bridge matching grant fund for the milling and overlay project was approved. The council approved an ordinance allowing the Syracuse Police Department establishing a fund for confidential funds. Confidential funds are monies budgeted for criminal investigations. A public hearing and first reading of the 2019 budget was held. There were no remonstrators. A second reading of the 2019 budget will take place at the council’s October meeting. In department reports, Town Manager Henry DeJulia attended a meeting regarding the flood control device in Crosson Mill Park. He hopes to have a total analysis of the situation at next month’s council meeting. Three of the four buildings for Travel Lite RV are complete in the industrial park and it is believed the company hopes to move equipment in soon. For the third time Harkless Road will be re-striped in front of Oakwood Park. Arrows on Railroad Avenue will be repainted and reflective material will be placed on the stripes down the middle of the road. Police Chief Jim Layne announced trick or treat hours will be 6 to 8 p.m. Wednesday, Oct. 31. The officer currently at the academy will graduate Sept. 28 and will be on patrol soon after. Layne requested permission to spend $6,000 to purchase a car for Troutman. Funds are available in the police budget for the purchase. The council approved the request. Layne reminded Interra customers to check their accounts. There have been a number of reports with problems with accounts, possibly due to someone using a skimmer. Chad Jonsson, park superintendent, reported a number of programs are coming up. On Sept. 29, there will be a wildlife program at the community center for children. Fall Harvest Fest will be Oct. 13 while the indoor garage sale will be Oct. 20. The Haunted Thrill will be held 7:30 to 9:30 p.m. Oct. 26-27 and Oct. 31 in Crosson Mill Park. A donor has also provided funds to replace the community center sign with a new digital sign. That project is moving forward. Fire Chief Mickey Scott reported the department held outdoor weather siren testing and everything worked fine. He has been working with the attorneys, contractors and builders on the building improvement projects at both stations and things are moving ahead. New LED signs will be installed at both stations as well. The new vac tanker has been sent back to the manufacturer because it was not up to bid specifications. Scott told the council he will not accept the new truck until it is built correctly to bid specs. “When you spend $280,000 you expect it to be built right,” he told the council.